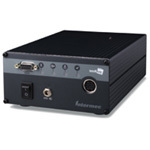 The ITRFxxx01 series Intellitag readers are specifically designed to provide cost effective solutions for implementing RFID into environments using programmable logic controllers (PLC), where RS232 and RS422 connections dominate. Introducing the new FCC-approved fixed reader, the ITRFxxx01, and module, the ITRMxxx01, to the existing Intermec Intellitag family of RFID tags, scanners and readers. The reader and module, available in either 915 MHz or 2450 MHz frequency bands, are ready for integration into supply chain management for retail operations, industrial manufacturing, and logistics applications. Both units are ideal for RFID solutions requiring an extended read range, multi-tag sort, read/write, and memory capacity not provided by "proximity" technology.